Fall is an exciting season for the Artist Cooperative of Canada. We are all participating in “Wild!” at the Spadina Museum as part of Scotiabank’s Nuit Blanche 2009 from October 3 to 4. In preparation, our members continue their artistic pursuits with passion and imagination. Elizabeth is preparing a series of nine-foot canvases in acrylic paint and is working on handpainted furniture in nighttime tones. These are based on the wild animals, insects and the flora and fauna of the pre-colonization area of Toronto. Alina is preparing a digital media show based on her paintings from on her kayak trip in the wilds of Georgian Bay. She is linking her interpretation to the “Wild!” show at Spadina Museum. 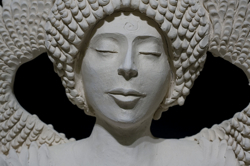 Frith is preparing a large, ceramic sculpture of a woman in the wild. On the pathway for the “Wild!” show, she will show a series of ceramic birds, eggs and nests in a naturalized setting. Gloria is keeping her installation under wraps, waiting to surprise “Wild!”‘s audience with her outstanding work. Her creation is bound to impress with its multi-level imagery. Guest artist Ximena is working on a series of photographs to display on a large screen. These are based on her interpretation of insect bites. Previous PostElizabeth Greisman: Solo August show entitled "Resonances from the Tyrone Guthrie Centre"Next PostScotiaBank Nuit Blanche 2009 – Another Fabulous Year!! !